Goche has just finished operating on Zamigo with some kind of mysterious enhancement. She tells him he can now play with LupinRed as much as he wants. Meanwhile, Sakuya still can’t believe that Umika would be one of the kaitous. He texts her, inviting her to lunch tomorrow. Umika asks Tooma for tomorrow off and he says it’s okay. Kairi teases her about it being a date. Umika heads upstairs. Kairi comments that Tooma looks like an overprotective father and jokes about them following Umika on her date with Sakuya. Next day, Noel comes into the office asking if there’s any Gangler activity. Commander Hilltop says everything’s quiet for now. Noel notices Sakuya isn’t here. They tell him it’s Sakuya’s day off and Noel immediately thinks he’s gone to see Umika. 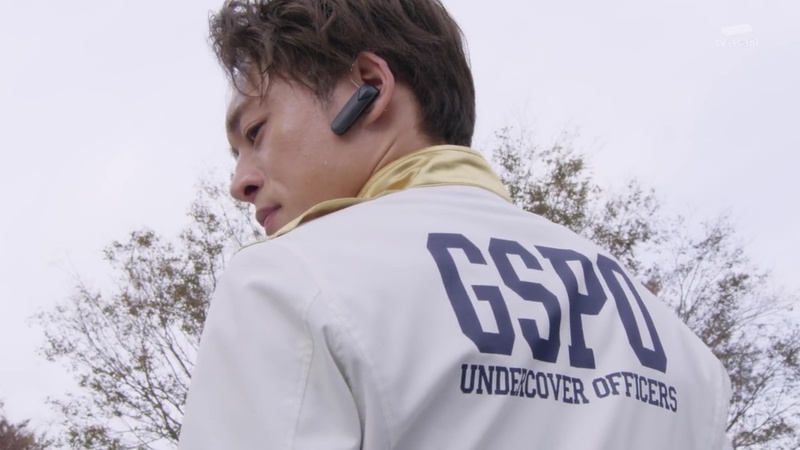 Keiichiro and Tsukasa remain suspicious of Noel. Sakuya meets up with Umika. He says she’s looking very kawaii today and they walk to the restaurant. A poorly disguised Tooma and Kairi follow. As they start eating their delicious lunch, Sakuya begins asking questions about Umika’s life. She talks about dropping out of school to study fashion and started working at Jurer to save money for it. 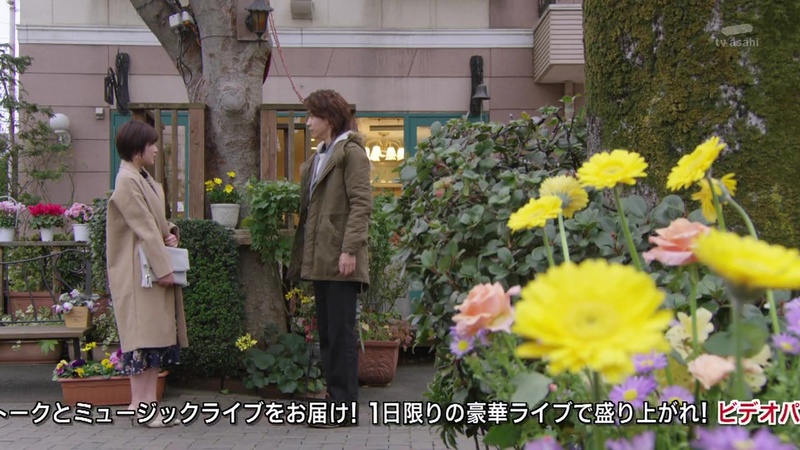 Sakuya then asks about the disappearance from two years ago and asks if she had any friends get caught up in that. That question is enough for Kairi and Tooma to realize the Pats are on to them. They text Umika to meet them by the restrooms where they tell her. They realize it’s only a matter of time before they are taken into custody. Back at the GSPO, the alarm sounds and Jim Carter tells them about the Gangler. 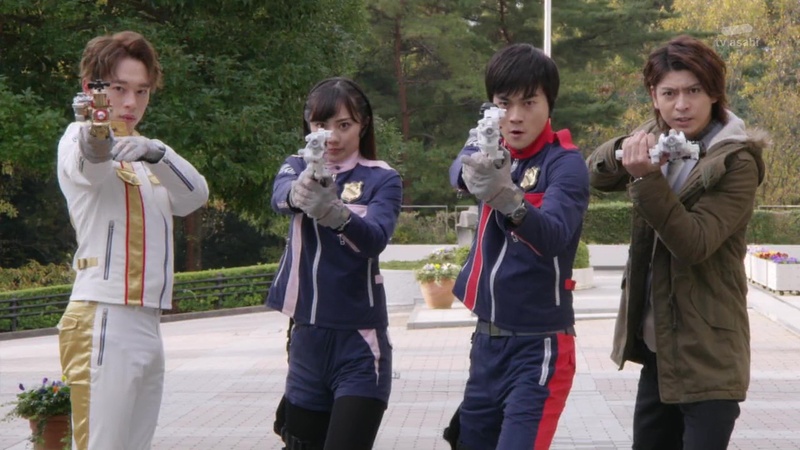 Keiichiro, Tsukasa and Noel head out as Jim Carter calls Sakuya. 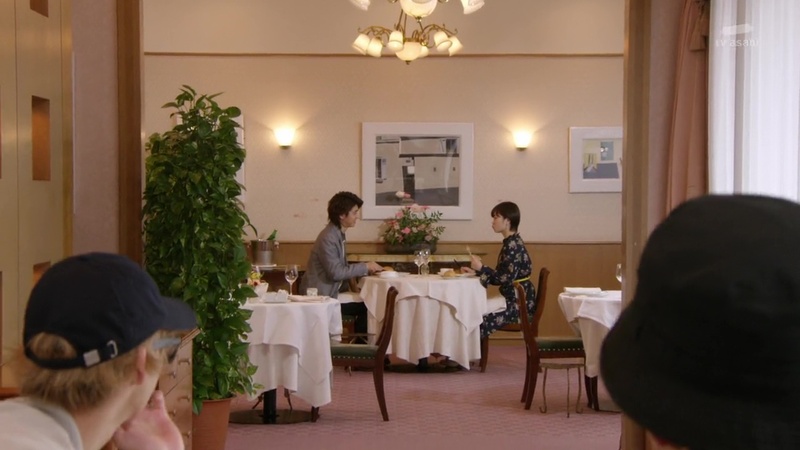 Umika returns to the table just as Sakuya gets off the phone. Sakuya apologizes to Umika and asks her to stay safe and head straight home. Umika also tells Sakuya to take care as he runs off. Kairi and Tooma tell Umika they should follow. But Umika asks if Kairi and Tooma can take care of this today. She realizes Sakuya does not suspect her and she doesn’t feel right about having been the one lying to him. Tooma reminds her that that’s what a kaitou is. Just then, they hear a familiar whistle. They run to the window and see Zamigo casually walking down the street chomping on ice balls. The Lups decide to pursue him instead and Umika decides to come with as she wants to end all of this as soon as possible. After the Pats take care of the Podamans, Goche walks out, eager to cut. The Pats morph. Meanwhile, the Lups confront Zamigo who says he’s been looking for them. 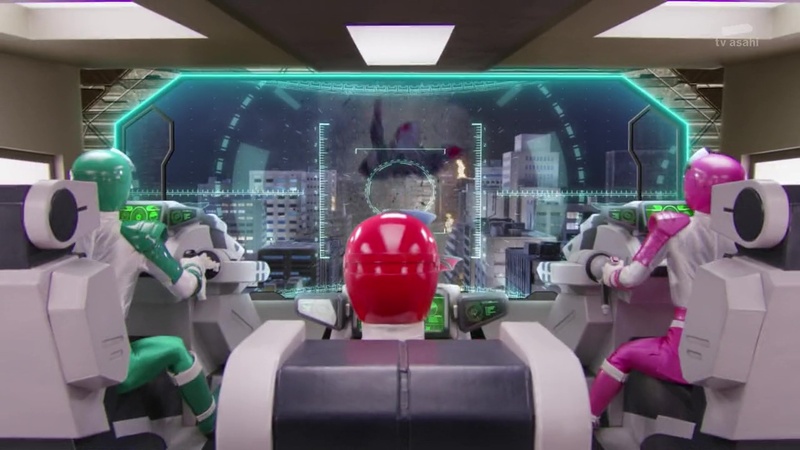 The Lups try hurling all they’ve got at Zamigo, but Zamigo’s newest safe (the modification from Goche earlier) allows him to turn his body into liquid. Dogranio is intrigued by what he is watching. Back with the Pats, Noel goes Lup and attempts to unlock Goche’s safe, but she uses Coupe de Gateau to stab Noel right in the chest. Zamigo completely mandhandles the Lups and he is able to leave the scene, unscathed. Goche begins attacking random buildings downtown as the Pats try stopping her. But she hits them and forces Keiichiro, Tsukasa and Sakuya to dehenshin. Noel gets up and tries facing her, but he is also forced to dehenshin. Noel apologizes to the Lups, but he has no choice. There’s only one thing he can do to protect everyone now. Noel gets up and confronts Goche who is trying to decide which of the three Pats she should cut first. The Pats get up, taken aback and unsure of what Noel is saying. Noel apologizes to the Pats for not telling them sooner. He explains that he’s the descendant of people from another world who came from the Gangler world long ago. Goche laughs and says cutting Noel would be more than enough to satisfy her craving. Noel hands the Pats all his VS vehicles. Noel expresses how happy he was when they told him that not helping him was not an option. The Pats say they will not allow Noel to sacrifice himself. Noel thanks them, but says this is how he can repay them. Goche can’t wait any longer. She grabs Noel and takes him away as she tosses up a Goram. Good Striker flies in and the Pats hop into PatKaiser. This Goram seems powered up. 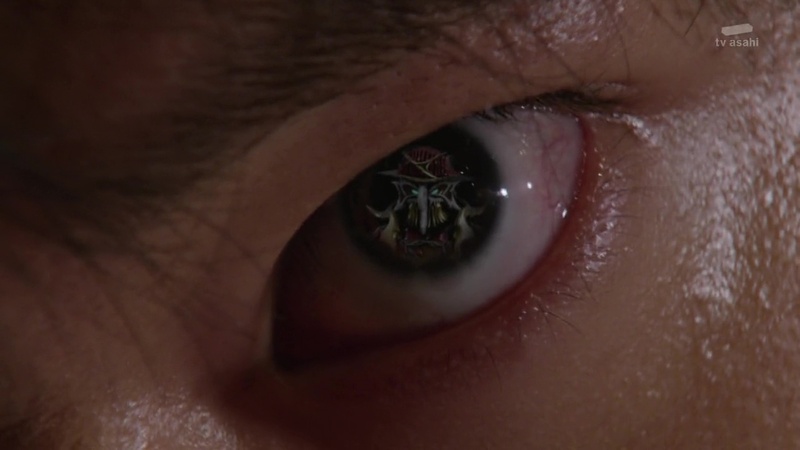 So Keiichiro uses Siren Striker to form Siren PatKaiser. They finish off the Goram with a Siren Strike. Goche brings Noel to Dogranio. Ooo! I very much enjoyed this episode. And it’s no coincidence that it was a Pats-focus ep. The Lups had their little moment with Zamigo of course, but this was definitely an episode focused on the Pats. 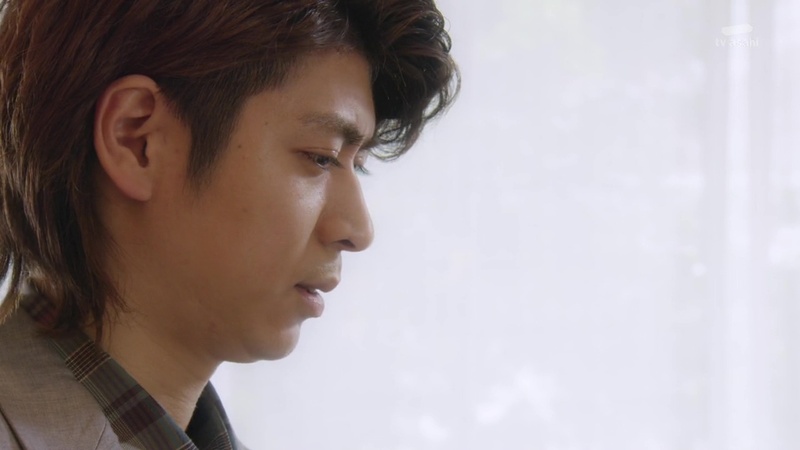 First, we see Sakuya and his trust in or wanting to trust in Umika. And what was great about it was that it wasn’t just him crushing on her or having googly eyes at her. He sincerely didn’t want to believe Umika was a kaitou. It was more than just mere lust on his part like the show has portrayed in the past. That sincerity allowed for the nice moments of Umika continuing to warm up to Sakuya. We’ve seen it a few times recently, but this episode really showed that Umika is starting to feel bad about their deception. In addition to maybe starting to have real feelings for Sakuya as well. I’ve wanted to see them play around with a Romeo & Juliet-type story between them more. It would’ve been a fun story to see a cop and a thief in love, but obviously can’t be together. Meanwhile, we again get to see the trust and bond the Pats have formed and developed with Noel. Especially after the recent circumstance of doubting him, they were able to reaffirm that they have a sincere connection as well, even if they do still have some suspicions. It’s a very interesting twist to have Noel captured. There’s still a couple more episodes, so this might just be to facilitate someone’s demise. But, it was a nice moment how Noel’s first reveal to the Pats came about. Back to Zamigo, I’m starting to tire of these bits of him popping in and out with no real story or development. 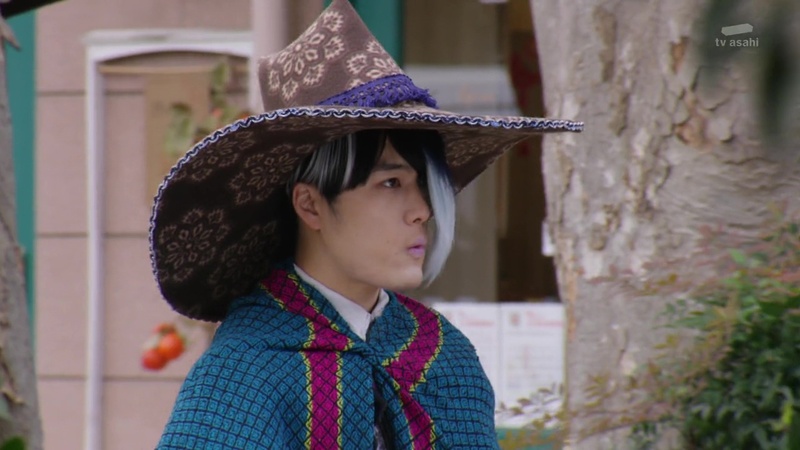 I feel like Zamigo is such a rich character with a lot of potential, but with only a couple eps left, I doubt there’s going to be any depth to his character anymore. Such a waste of great potential. Elsewhere, what an awesome shot with the view form the cockpit. First time? 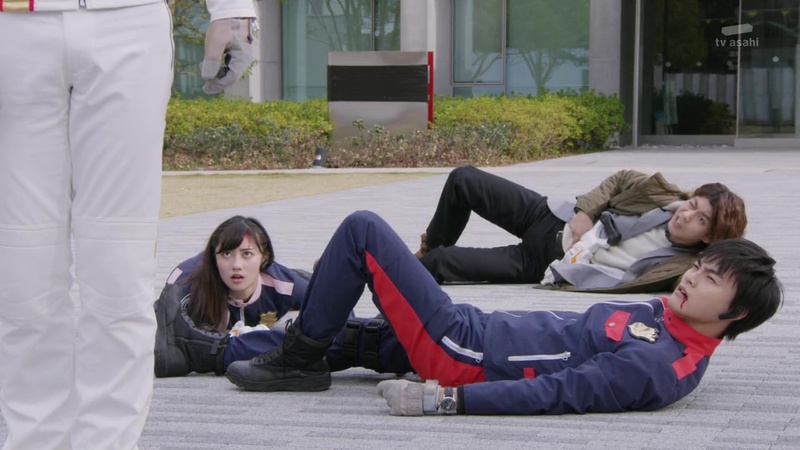 Overall, an exciting episode. I certainly hope they keep it up to the finale. Indeed, I had and STILL I HAVE goosebumps! Umika really starts to very liking Sakuya. I’m certain that thanks to them, and Noël(!) maybe it’s gonna be much faster the truce between Lups and Pats. And now we’re impatiently waiting for next episode!